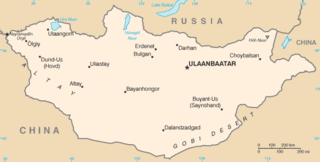 Mongolia is a landlocked country in Central Asia and East Asia, located between China and Russia. The terrain is one of mountains and rolling plateaus, with a high degree of relief. The total land area of Mongolia is 1,564,116 square kilometres. Overall, the land slopes from the high Altai Mountains of the west and the north to plains and depressions in the east and the south. The Khüiten Peak in extreme western Mongolia on the Chinese border is the highest point. The lowest point is at 518 m (1,699 ft), an otherwise undistinguished spot in the eastern Mongolian plain. The country has an average elevation of 1,580 m (5,180 ft). The Bayankhongor Province or Bayanhongor Aimag is one of the 21 aimags (provinces) of Mongolia. It is located in the southwest of the country and, at 116,000 square kilometers, it is one of the largest aimags. The capital of the aimag shares the provincial name, Bayankhongor. Zavkhan is one of the 21 aimags (provinces) of Mongolia, located in the west of the country, 1,104 km from Ulaanbaatar. Its capital is Uliastai. The aimag is named after the Zavkhan River, which forms the border between Zavkhan and Gobi-Altai aimag. Lake Khövsgöl, also referred to as Khövsgöl dalai or Dalai Eej, is the largest fresh water lake in Mongolia by volume and second largest by area. Khövsgöl Nuur is nicknamed "Younger sister of the Sister Lakes ". Uvs Lake is a highly saline lake in an endorheic basin - Uvs Nuur Basin in Mongolia with a small part in Russia. It is the largest lake in Mongolia by surface area, covering 3,350 km² at 759 m above sea level. The northeastern tip of the lake is situated in the Tuva Republic of the Russian Federation. The largest settlement near the lake is Ulaangom. This shallow and very saline body of water is a remainder of a huge saline sea which covered a much larger area several thousand years ago. Bayantooroi is a settlement in the Tsogt sum (district) of Govi-Altai Province in western Mongolia. Uvs Lake Basin is an endorheic basin located on the territorial border of Mongolia and Tuva, a republic of the Russian Federation. The basin is part of the Central Asian Internal Drainage Basin and is named after Uvs Lake, a large saline lake situated in the western part of its drainage basin. Uvs Lake is a shallow lake with an area of 3,350 km2 (1,290 sq mi). Its entire basin, which includes several smaller lakes, is 70,000 km2 (27,000 sq mi). The Great Lakes Depression, also called the Great Lakes' Hollow is a large semi-arid depression in Mongolia that covers parts of the Uvs, Khovd, Bayan-Ölgii, Zavkhan and Govi-Altai aimags. Bounded by the Altai in the West, Khangai in the East and Tannu-Ola Mountains in the North, it covers the area of over 100,000 km2 (39,000 sq mi) with elevations from 750 to 2,000 m (2,460–6,560 ft). The Tayan Nuur mine is an open-pit iron ore mining project in Tseel district within the Govi-Altai Province of Mongolia, approximately 162 kilometres (146 mi) south of the Gobi Altai Province capital Altai. The site was discovered in 2006, and is being developed by Altain Khuder LLC of Mongolia, a Mongolian-registered mining and mineral exploration company. Since its initial drilling exploration, Altain Khuder LLC developed Tayan Nuur mine into one of the leading iron ore mines in Mongolia. Tayan Nuur mine produces over 60% Fe grade iron ore concentrates and exports it to steel mills in China. The United Nations Educational, Scientific and Cultural Organization (UNESCO) World Heritage sites are places of importance to cultural or natural heritage as described in the UNESCO World Heritage Convention, established in 1972. The Altai montane forest and forest steppe ecoregion covers patches of the subalpine forest belt on the Altai Mountains, crossing the border region where Russia, Kazakhstan, Mongolia and China meet. The region has high biodiversity, as it is located in transition zones between different ecoregions, altitudes, and climate zones. It is in the Palearctic ecozone, with a Cold semi-arid climate. It covers 35,199,998 km2 (13,590,795 sq mi). The Sayan montane conifer forests ecoregion covers the mid-elevation levels of the Sayan Mountains, the high mountain range between the taiga of Siberia, Russia to the north, and the steppes of Mongolia to the south. The slopes of the mountains at the mid-altitudes are covered by Temperate coniferous forest. The ecoregion is in the Palearctic ecozone, with a Cold semi-arid climate. It covers 35,741,835 km2 (13,800,000 sq mi). The Altai alpine meadow and tundra ecoregion is a terrestrial ecoregion covering the higher elevation of the Altai Mountains at the center of the "X" formed by the borders separating Russia, Kazakhstan, China, and Mongolia. The mountain peaks are the farthest north in Central Asia, separating the plains of Siberia to the north from the hot, dry deserts to the south. Altitudes above 2,400 meters display characteristics of tundra, with patches of alpine meadows and some trees immediately below the treeline. The ecoregion is in the Montane Grasslands and Shrublands biome, and the Palearctic ecozone, with a Humid Continental climate. It covers an area of 90,132 square kilometres (34,800 sq mi). The Great Lakes Basin desert steppe ecoregion covers the enclosed basin centered on Uvs Lake, a saline, endorheic basin in northwestern Mongolia. A portion of the ecoregion stretches across the region into Russia. The lake district is important for migrating birds, waterfowl, and seabirds. The ecoregion is in the Palearctic ecozone and the deserts and xeric shrublands biome. It has an area of 157,212 square kilometres (60,700 sq mi).